Do you love word play? Have you taught your kids to enjoy word play too? 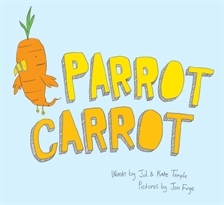 If you're looking for a children's picture book that will start a lucky pre-schooler off on the road to becoming a logophile, look for Parrot Carrot. Written by Jol and Kate Temple, and illustrated by Jon Foye, it was published by Allen and Unwin (2011). Parrot Carrot is just the right size for little hands, and its soft puffy cover begs to be touched. The illustrations are simple and quirky, a perfect complement to its very simple text. I think it would make a lovely choice as a gift for a new baby or toddler. Perhaps accompanied by a carrot. Or a parrot? Young readers will take pleasure in trying to combine rhyming objects for themselves. Teaching kids to play with words is so useful for their future. It helps their spelling, their reading, and most importantly, it means they will grow up to appreciate words in all their many guises and formats. They might learn to love cryptic crossword puzzles or scrabble, enjoy writing haiku or heroic poetry, or parlay their way into a creative job in advertising. And they'll join a happy throng that simply loves to mess about with words. Sounds like a really fun book! It's always a wonderful thing to find books that make you laugh. And you know what, it's so important for children to learn how to connect the dots of seemingly unrelated things and use their imagination! Thanks, Susan. This book also has a companion iPhone app. It brings the whole thing to life even more. You can find it at http://www.parrotcarrot.com.